Columbus, Ohio (July 24, 2018)--A few weeks ago, Dr. Anne Dorrance wrote an article about foliar fungicide application to soybean for control of frogeye leaf spot disease. She recommended spraying at the R3 growth stage. (Her entire article is here: https://agcrops.osu.edu/newsletter/corn-newsletter/2018-19/we-have-found-some-whiskers-spores-cercospora-sojina). 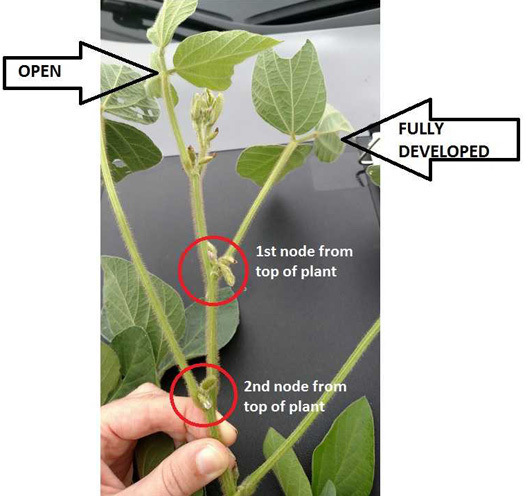 A soybean plant is at the R3 growth stage when there is a pod at least 3/16 inch long (but less than 3/4 inch long) at one of the four uppermost nodes on the main stem with a fully developed leaf. (A leaf is fully developed and the node is counted when the leaf at the node immediately above it is open.) The soybean plant pictured is at the R3 growth stage. In our research trials in Clark County (planted the first week of May), Group 2 and 3 soybeans entered the R3 growth stage during the first two weeks of July. They are now at the R4 to R5 growth stage. Don�t rely on plant height, calendar date, or your neighbor�s field�Walk your own fields (each year) to assess growth stage. � Soybean plants within a field may be at different growth stages. Over half of the plants need to be at a certain growth stage for the whole field to be considered that growth stage. 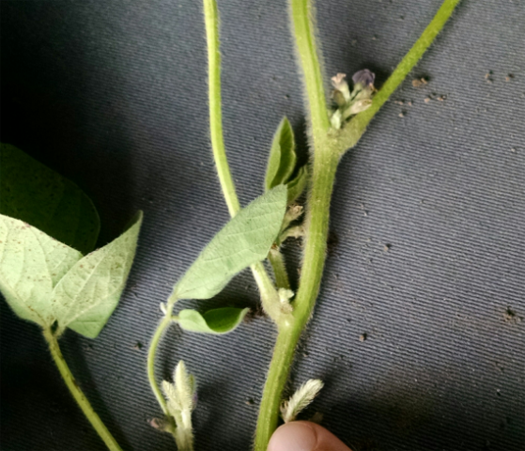 � An individual soybean plant may have flowers, pods, and seeds filling all at the same time. The soybean plant develops from bottom to top. For more information on soybean staging, see A Visual Guide to Soybean Growth Stage by Dr. Shawn Conley (University of Wisconsin-Madison) available here: https://coolbean.info/library/documents/2017_Soybean_GrowthDev_Guide_FINAL.pdf.